If you live in the Parish of St.Peter’s Parkstone you are entitled to have your baby Baptised in the Parish Church and we shall be delighted to welcome you. When you first make contact one of the Clergy will come round to visit you to start to get to know you and to talk with you about what Baptism is. Babies are Baptised as close to their birth as possible and you should certainly try to make sure you arrange it so that it takes place before they reach 9/10 months old. Once they’re a year old it can become quite hard for them and it might be better then to wait till they’re a few years older so they can take part actively. The key message is, do get in touch early. Phone or email now if you want to ask for your baby to be Baptised. 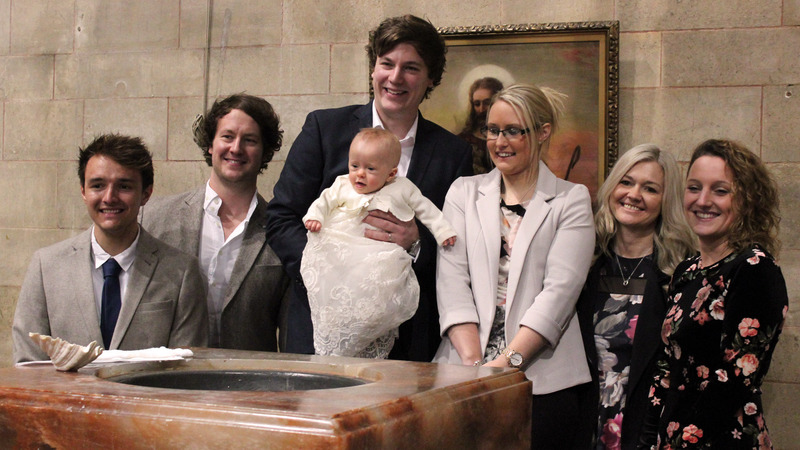 If you don’t live in the Parish it’s generally better for your baby to be Baptised in your own Parish Church. This will get you in contact with the Church where you are. If you don’t live in the Parish of St.Peter’s but have a strong and current connection (for instance if you or the baby’s grandparents worship here each Sunday) it may be possible for your baby to be Baptised here as long as your own Vicar agrees. If you think you have such a connection phone or email now to enquire. Baptism services take place once a month. Sometimes they are part of the main Sunday service at 10.00am and sometimes there is a separate Baptism service at 12.15pm. The Priest who visits you will discuss the date with you. As a general rule you might find it better to be part of a 10am service if you’re used to Church but if you’re not you might prefer a 12.15 Baptism. If your older child is not already attending Church or Sunday school the first thing to do is to start coming on Sundays. Broadly the pattern regarding residence in the Parish, and joining in the preparation is the same as for babies. The big difference is that sometimes with older children it’s better for them to wait a few years and then be Baptised and Confirmed together. There will always need to be some discussion with the Clergy to determine what’s best in the particular circumstances. So… start coming to Church if you don’t already do so but by all means phone or email to enquire. More and more people are discovering the riches of the Christian faith and asking for Baptism. This is a big commitment and adults who have not been Baptised before are Baptised and Confirmed at the same time. If you’re not already coming to Church regularly you should start now and then you can discuss it with one of the Clergy. Among other things, we’ll tell you all about the preparation course. Do phone or email the Vicar to enquire further if you wish. You’ll be very welcome indeed. Bookings for baptisms are taken through the Rector, Fr Michael Camp. To send an enquiry, either send an email via the form below or contact our church office on 01202 749085.